If you find a lower price on any of our items either before or within ten days of purchase, we will refund you 110% of the difference. The item has to be offered for sale by an authorized dealer of the the manufacturer, must be in stock, and in new condition. All costs including shipping, and handling charges should be included in the price comparison. (note our free shipping policy). We cannot match prices listed in error on other sites, or close-out prices. Please use our Contact Us Form. You can also insert the price match information while placing your order in the comments box (below the billing address). We will either match the price and process the order, or give you a chance to cancel. While we strive for our web site to be error free, errors may occur in descriptions, prices, or shipping quotes. In the event a product is listed at an incorrect price due to typographical error or error in pricing information received from our suppliers, Zanadia.com shall have the right to refuse or cancel any orders placed for product listed at the incorrect price. Our Store shall have the right to refuse or cancel any such orders whether or not the order has been confirmed and your credit card charged. If your credit card has already been charged for the purchase and your order is canceled, our store will refund your method of payment in the amount of the incorrect price. We work hard at packaging your order to arrive in perfect condition. Please unpack and inspect your shipment as soon as it is received. For damaged items please save all items and packaging materials and contact us immediately. All damage must be reported within one week of receipt of merchandise. We are not responsible for damage not reported in a timely manner. Most items are gladly accepted within 30 days from the day you receive your items. No returns without Authorization. Please fill the Returns Form for a merchandise return authorization number before returning any items. RMAs are only issued by e-mail. Items returned without a RMA will be refused by the warehouse and/or will incur a 20% restocking fee, and you may incur shipping charges both ways from the shipping company you used. Complete: Puff Chairs, Puff Rockers & Puff Ottomans are returnable with a 20% restocking fee within 30 days of receipt. See Exception details below: Exceptions apply for Jewelry, Rugs, Puff Chair items, Pouf Ottomans and Furniture. Items returned in new, unused condition, and in original packaging with boxes and all tags attached with a valid RMA will receive a full refund less any paid shipping charges (see exceptions below). Sealed items must not be un-sealed. Returns need to be shipped back within 30 days of original delivery date, and must be sent to our shipping warehouse as instructed on the RMA. Please send your returns in a track-able insured manner (UPS, Fed-EX, or Insured Priority Mail). Customer pays return shipping charges. Please insure your return against damage or loss in transit Items received damaged will not be refunded. Items damaged during return transit are the responsibility of the sender to claim with the shipping company. Items returned missing packaging, parts or components will not be refunded (do not return free samples if any). Please do not refuse any items that are shipped to you. Refused or undeliverable items will accrue restocking fees in addition to shipping charges both ways. All furniture Items including Puff Chairs, Puff Rockers & Puff Ottomans. Pixels wall, bed bases, covers & headboard panels. Replacement Covers with & Without cushions and Replacement Frames. Jewelry has a 14 day return window from the day you receive it to the day you ship it back Also all jewelry is sent with a safety plastic loop threaded through the piece. Cutting this loop voids the return privilege, and the item is considered non-returnable. Jaipur Rugs returns must arrive at the Georgia warehouse within 30 days of delivery. Returns must be in new condition with no contamination of any kind including pet hair. Some perfumes & colognes are shipped in sealed bags. For customer safety these perfumes are not returnable if they are un-sealed. 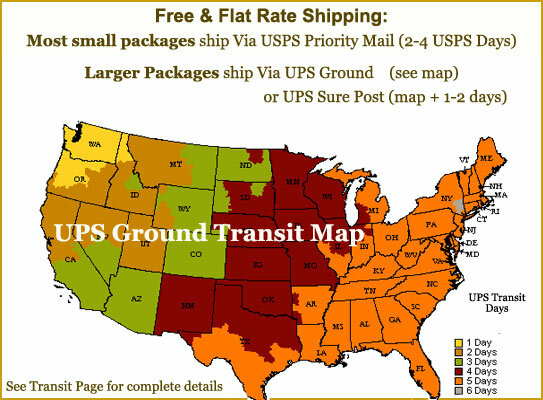 Free shipping is valid only on ground shipments to one location within the contiguous 48 states (does not apply to APO addresses. Customers must provide street address for free shipping (We will ship to a PO Box if packed weight is under two Lbs). We reserve the right to charge shipping on returned orders because of wrong addresses, or for multiple returns of purchases. Refused or un-deliverable orders may accrue a 20% restocking fee in addition to all shipping charges. Click here for transit times and other shipping information. In cases where the software applies free shipping to non-qualifying orders, full shipping charges will be added to the orders. In order to facilitate your shipments, we will choose the carrier of our choice (in the same class of service), regardless of which was selected. Shipping expenses can be quite high, and we strive to keep our costs low to offer you the best possible prices. UPS imposes a $12 address correction fee that will be passed on to the customer when correcting an address on a shipment. UPS imposes this fee whether a delivery attempt is made or not. In case a shipment is returned for a wrong shipping address or otherwise, full actual shipping charges both ways plus any other incurred fees will be applied to the order. Undelivered shipments may also incur additional restocking fees. PayPal rules specify that we can only ship to the address provided by PayPal. We ship International orders via UPS, or USPS (United States Postal Service). Some countries may have duty and tax charges that the customer will be responsible for upon receiving the merchandise. For shipments to Canada, UPS will collect a $10 brokerage fee in addition to any duty or taxes. Note that certain vendors do not allow International sales of their products. We will make every effort to accommodate your request to cancel or change your order. We (and our factories) try to ship your items in the shortest possible time, so sometimes there is no way to change or cancel orders. On furniture items and covers, we can not change orders once they have gone into production. We do gladly accept returns. Please fill a Return Request Form for a return merchandise authorization. We will issue an RMA for your return. Customers will be responsible for all shipping charges back to our shipping warehouse. Please do not refuse any items that are shipped to you. Refused items incur a 20% restocking fee in addition to actual shipping charges both ways. We can send your gifts anonymously, HOWEVER if the recipient requests the name and address of the sender we are obligated to provide that information. We also write on the packing slip that the sender requested that this gift be anonymous, and ask the recipient to contact us for that information if they so desire. Our Store shall automatically charge and withhold the applicable sales tax for orders to be delivered to addresses within Washington state. For orders shipped to other states, we will not collect any taxes and you are solely responsible for all sales taxes or other taxes in your state. Unless otherwise specified, all materials appearing on this site, including the text, site design, logos, graphics, icons, and images, as well as the selection, assembly and arrangement thereof, are the sole property of this Store., Copyright Zanadia.com. All Rights Reserved. You may use the content of this site only for the purpose of shopping on this site or placing an order on this site and for no other purpose. No materials from this site may be copied, reproduced, modified, republished, uploaded, posted, transmitted, or distributed in any form or by any means without our prior written permission. All rights not expressly granted herein are reserved. Our Store is not responsible for the actions of third parties. We are sorry. We do not accept checks or Money orders for payment. We offer many different methods of payment including PayPal. PayPal allows you to pay by a credit card or will deduct the amount directly from your bank account. You can click the PayPal Button on the Shopping Cart page. PayPal is one of the safest payment methods and is accepted at most web sites, and now it is also becoming accepted at regular retail stores. For a multiple product order, we will make every attempt to ship all products contained in the order at the same time. Products that are unavailable at the time of shipping will be shipped as they become available, unless you inform us otherwise. Typically you will only be charged for products contained in a given shipment, plus any applicable shipping charges if any. If the back order is a small part of the order and is expected shortly, we might charge the entire amount with the first shipment. You will only be charged for shipping (if any) at the rate quoted to you on your purchase receipt. The entirety of this shipping charge may be applied to the first product(s) shipped on a multiple shipment order. If paying by PayPal the entire amount will be charged at the time the order is placed. Puff Chair items are charged at the time the order is placed. Zanadia.com reserves the right at any time after receipt of your order to accept or decline your order for any reason or to supply less than the quantity you ordered of any item. Prior to shipping we may cancel any order and refund any amounts charged. For help with web site accessibility, please contact customer service at (888) 729-7997. These Conditions will supersede any terms and/or conditions you include with any purchase order, regardless of whether Zanadia.com signs them or not.